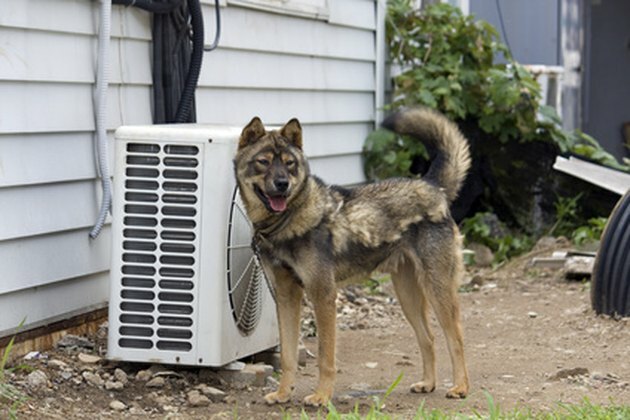 Most homes with an air conditioning system manufactured before January 1, 2010 use R-22 as the refrigerant. The AC compressor circulates the refrigerant through the system's pipes, metering devices and coils. AC systems with a low R-22 charge do not perform at peak efficiency. In a clean and sealed system, an R-22 charge of less than 58 psi forms ice on the evaporator coil -- the inside coil. If the AC system has clean, leak-free coils, a clean filter and both fans operating at the correct speed, then charging an AC with the correct amount of refrigerant maintains peak performance. Technicians charge an AC compressor at the outside unit. Turn on the air-conditioning system. Turn the thermostat to its coolest setting. Remove the caps covering the outside AC unit's R-22 refrigerant valves. These are found on the pipes entering the outside unit. Some valve covers twist off by hand, and some require an adjustable wrench. Screw an R-22 manifold gauge's left-hand hose onto the valve on the large refrigerant pipe. Only charge an AC system with gauges designed for R-22, as stated on the left-hand gauge. Screw an R-22 manifold gauge's right-hand hose onto the valve on the small refrigerant pipe. Purge the air from the manifold's hoses. Open each manifold handle for one second. The air in the hoses will exit the manifold's middle hose. Screw the R-22 manifold gauge's middle hose onto a jug of R-22 refrigerant. Turn the R-22 jug upright, so its valve faces upward. Open the R-22 jug's valve. This keeps the liquid refrigerant away from the valve. Let the system's refrigerant pressures equalize. The needle on the left-hand gauge will stop falling, and the needle on the right-hand gauge will stop rising when the system has equalized. This can take from three to five minutes. Look at the psi reading on the left-hand gauge. If the gauge reads below 60 psi, then open the left-hand gauge's handle for 30 seconds. Allow the pressure to equalize. Repeat this until the psi reading reaches 60. Allow the system to run for five minutes. Place a thermometer on the large refrigerant pipe 6 inches from the service valve. Take the thermometer's reading, called super-heat, once it has stopped dropping. Find the refrigerant pressure that relates to the thermometer's reading. If the manifold's left-hand gauge has a temperature scale next to the psi scale, then use it. If not, then use a pressure/temperature chart -- called a P/T chart. Compare the super-heat reading to the gauge's psi reading. If the super-heat reading is more than 20 degrees above the P/T chart's reading, then add R-22 until the super-heating reading reaches the optimal range -- between 8- and 18-degree super-heat, depending on the environmental conditions. Many technicians charge the system until it has a 12-degree super-heat; about 70 psi at 85 F. If the super-heat reading is below 7 degrees, then the system usually has an overcharge, a stuck metering device or a dirty coil. Close the R-22 jug's valve. Then disconnect all of the hoses, and replace the service valve caps. Based out of Central Florida, Robert Sylvus has been writing how-to and outdoor sports articles for various online publications since 2008. Sylvus has been a home improvement contractor since 1992. He is a certified HVAC universal technician.